"There are no ordinary moments." The Peaceful Warrior. A new way of mapping tech companies – user first degree or second degree? Founding DNA does not change. When someone asks me what are the big challenges facing a company of any size, I tend to examine the founding DNA. The challenges ahead are typically a reflection of how the founding DNA defers from the prevailing trends. When Microsoft was founded, its DNA was built around a simple rule – software solves problems. Software, in the hands of millions through PCs allows everyone to improve productivity. If you draw a connection graph, the first degree connection is to “software”. Hence building and distributing more applications of software is the natural path of progress. With Google, the DNA was coded in the founding algorithm – make information useful, relevant and accessible. 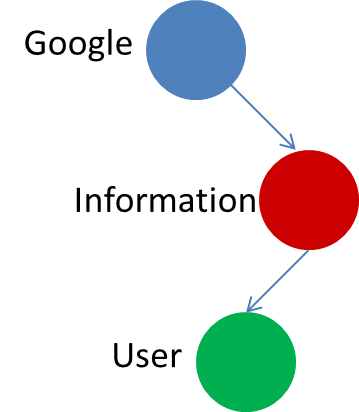 Although Google has always talked about the user being supremely important in this paradigm, I would still argue that ‘information’ is a first degree connection at Google, and user is still a second degree. Searching through new and never-indexed sources of information, and solving for the “right” answer in the form of ‘related pages, or related advertisements, or related queries’ is the core DNA. The technically as-right-as-possible answer is more important at Google than anywhere else. When a second-degree company encounters a first-degree competitor, they usually resort to head-on competition as Google did with Google Buzz/Currents/Keep. The problem is that users only cares about visible disruption hence I’m not in favor of head-on competition, which makes one product look like an imitation. I’d be happier to see large companies take a startup-approach where the competitor’s idea is reinvented for a new segment with a refreshing approach (as was done by SnapChat or Tumblr). This mapping is a useful way to understand opportunities and threats. Ultimately, success is not about being a first or a second degree company. One can argue that Microsoft was multiple degrees away from the user as compared to alternatives today. The important learning is that every new entrant moved one degree closer. Good execution is about being who you are – embracing your DNA and pursuing it for a long time. After all, it’s that original DNA that made a small company into an Apple or a Microsoft or a Google. The Goddess of Wealth is having it easy! Why is the ALS Ice Bucket Challenge so popular?